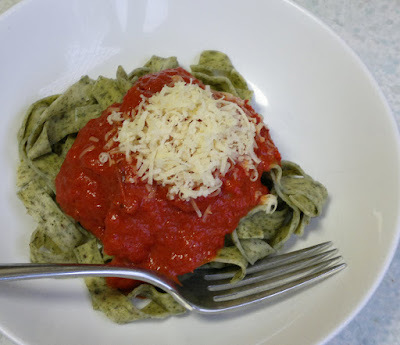 Pasta and sauce is a regular on our weekly menu. 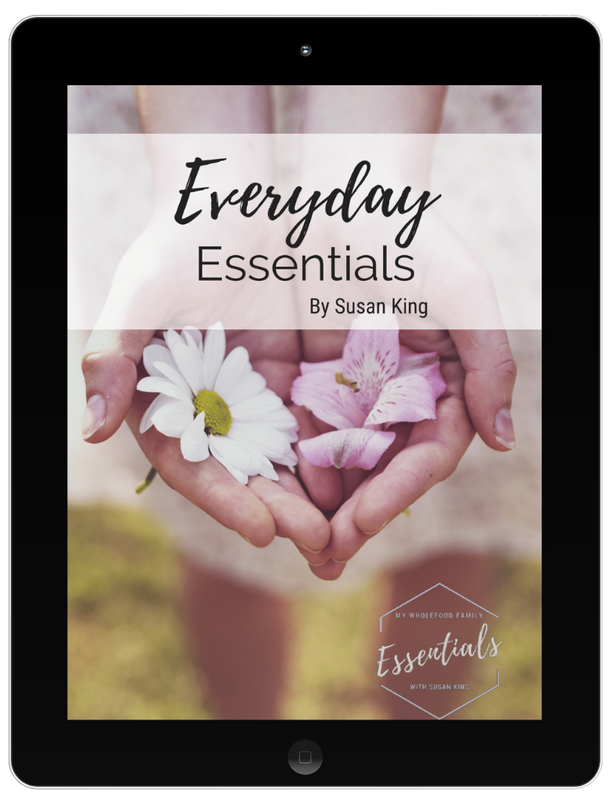 It's easy, the kids love it and there's always leftovers for hubby's lunch the next day. After spying some gorgeous red capsicums and Roma tomatoes at the fruit shop on the weekend, this yummy pasta sauce was born! It's pictured above with some egg tagliatelle with herbs from Aldi of all places. 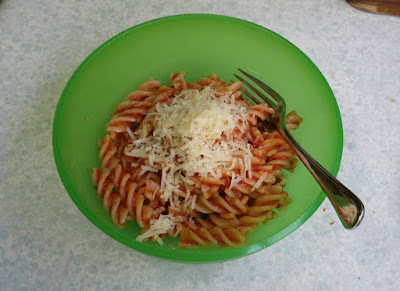 The pasta cooked up beautifully in just a few minutes and was a great partner for this sweet and silky sauce. Preheat oven to 230 degrees C and have 2 large baking dishes ready. Slice each tomato in half length ways and place in one of the baking dishes. Place the whole unpeeled head of garlic in the centre and drizzle over 2 tbs of olive oil. Use your hands and toss well to combine. Sprinkle the tomatoes with salt, pepper and the sugar. Drizzle a little olive oil over the capsicums and place in the other oven tray. 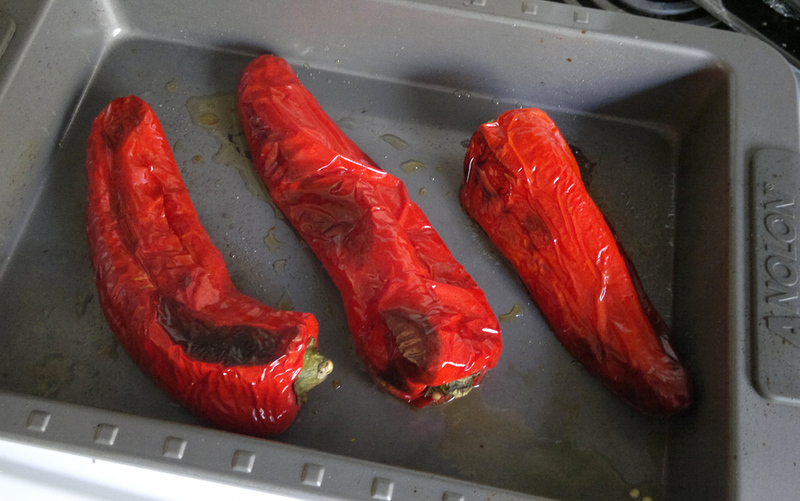 Place both trays in the oven and roast for about 40 minutes or until the the capsicums are blackened and soft. Remove the capsicums from the oven and place in a heatproof bowl. Cover with plastic wrap and let sit for 5-10 minutes. Check the tomatoes and garlic, they may need another 10-15 minutes. Remove from the oven when the tomatoes are softened, collapsed and beginning to colour. To prepare the capsicums you need to remove the skins. If they are cooked properly it should come away quite easily. Use a small sharp knife to make a slit and very carefully use your fingers to pull the skins away from the flesh. They will be hot so watch out for burnt fingers! Discard the skin and seeds and chop the flesh coarsely. Into the bowl of a food processor, add the tomatoes, peeled capsicums and then squeeze out 5 or 6 cloves of the cooked garlic. Garlic cooked like this has a richer, milder flavour than raw garlic so you can go a little crazy here. Add 4 tbs olive oil and blitz to combine. When smooth, return to a pot to keep warm over a low heat. Check for seasoning and add salt, pepper and fresh herbs to taste. (The sauce can be served immediately or refrigerated overnight to allow the flavours to develop. I used a tagliatelle with herbs in it so did not add fresh herbs to my sauce). Cook your pasta according to packet instructions. Drain and serve with the sauce and plenty of freshly grated Parmesan cheese. I also did a more kid-friendly version with spiral pasta and regular tasty cheese which went down a treat! This sauce would also be fantastic on a char-grilled pizza with lots of feta or goats' cheese. I have stashed some in the freezer to try later on. Will let you know how it goes.